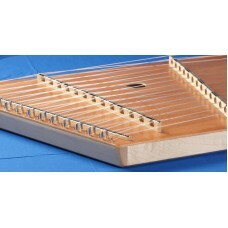 Grassroots Hammered Dulcimers have a unique and beautiful sound. 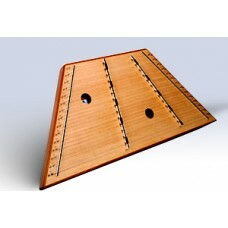 Grassroots dulcimers come in 2 sizes. The larger size is referred to as 15/14. The 15 is the number of pairs of strings passing over the treble (center) bridge. 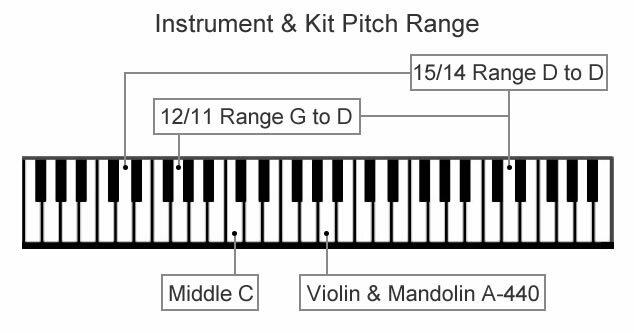 The 14 is the number of string pairs passing over the bass (right) bridge. 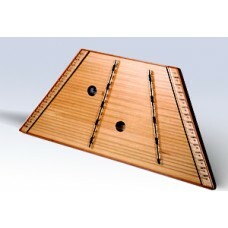 The smaller size dulcimer has 12 and 11 string sets passing over the treble and bass bridge, respectively. Pin blocks and all other structural members are built from hard maple. Hard maple is ideally suited for a variety of musical instruments including dulcimers, violins and pianos. It is unsurpassed in beauty, strength and stability. We offer spruce, a preferred material, for the soundboards because of its strength and superior acoustical properties. We continue to offer soundboards of mahogany or red oak plywood as a lower cost alternative, because they are structurally stable and strong. Bridges are meticulously crafted of hard maple and capped with black delrin. Nickle-plated zither pins and hitch pins hold the finest quality music wire. Backs are of high quality plywood. 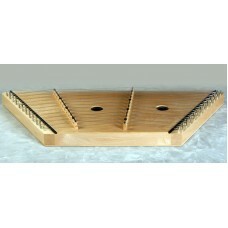 Our Heritage 15/14 dulcimer has a floating solid spruce soundboard. Spruce is the wood most often us.. 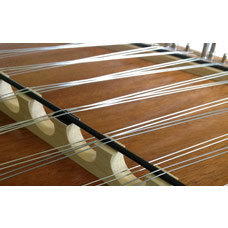 The soundboards of the Classic II dulcimers are solid spruce that are glued at the parameter to the ..
As a low cost alternative, Grassroots continues to offer plywood soundboards. They are structurally ..
We have made a variety of subtle changes in order to offer an instrument at this budget price. The s.. 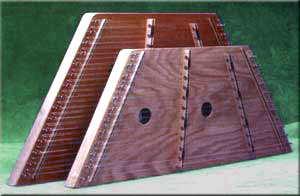 When the renaissance of interest in the hammered dulcimer began in the late 1960’s, most instruments were the 12/11 size. Over the succeeding years, the larger 15/14 size has become the preferred size by most players. The 15/14 offers a greater range of notes, and thus, greater flexibility. Weight 17 lb. 17 lb. 16 lb. 12 lb. 11 lb. Length 41-1/4" 41-1/4" 41-1/4" 37" 37"
Width 19-1/4" 19-1/4" 19-1/4" 15-1/2" 15-1/2"
Depth 3-1/2" 3-1/2" 3-1/2" 3-1/2" 3-1/2"